Laura Pohl, 94, of Mt. 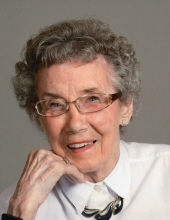 Pleasant, passed away Tuesday, March 19, 2019, at Maplewood Assisted Living. A Funeral Mass for Laura will be celebrated at 10 a.m. Friday, March 22, at St. Joseph the Worker Catholic Church in Beal City with Father Thomas Held as celebrant. Burial will be in St. Joseph Cemetery followed by a luncheon at the Beal City Knights of Columbus Hall. The family will receive friends in the gathering room of the church on Thursday from 4-7:30 p.m. with the Vigil beginning at 7:30 p.m. Visitation continues Friday one hour prior to Mass. Memorial contributions may be made to the wishes of the family. Envelopes will be available at Charles R. Lux Family Funeral Home and the church. Laura was born February 15, 1925, in Mt. Pleasant, daughter of the late Julius and Alida (Claus) Windel. A graduate of Sacred Heart Academy, Laura married Raymond Pohl on October 11, 1947, at Sacred Heart Church. She worked as a nurse attendant at the state home for 10 years. For over 30 years she was a Gold Key Volunteer at the Commission on Aging, crocheting hats for newborn babies. During her time at Maplewood, she enjoyed playing Euchre and Bingo and the numerous field trips. Years ago, she and Raymond were in a card club and antique car club. She was an adoring Tigers fan. More than anything, she was a loving wife, mother, and grandmother who will be fondly remembered and dearly missed. Laura is survived by two daughters, Linda Fox and Peggy Reihl, both of Beal City; five grandchildren, Matt (Tammy) Fox, Sarah Fox Bendele, and Bart Fox, and Nicholas (Kristy) Reihl and Joshua (Angie) Reihl; 13 great grandchildren; two sisters, Alice D’Hulster of Harper Woods and Rose Robinson of Lansing; and numerous nieces and nephews. She was preceded in death by her parents, Julius and Alida Windel; husband, Raymond Pohl in 1991; son in-law, Harold Reihl in 2012; and sisters, Helen Johnson, Leona Halfmann, and Annie Halfmann. The family thanks the wonderful staff and residents at Maplewood for treating her so well the past six years. To send flowers or a remembrance gift to the family of Laura M. 'Shorty' Pohl, please visit our Tribute Store. "Email Address" would like to share the life celebration of Laura M. 'Shorty' Pohl. Click on the "link" to go to share a favorite memory or leave a condolence message for the family.